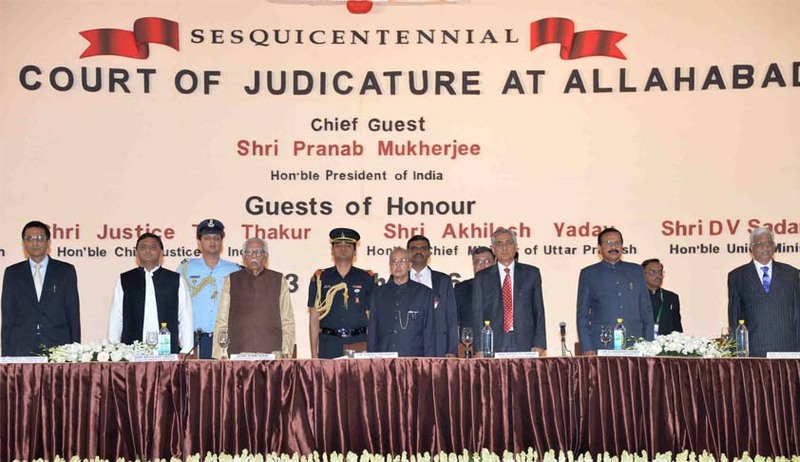 The President of India, Shri Pranab Mukherjee inaugurated the Sesquicentennial Celebrations of the High Court of Judicature at Allahabad today . Speaking on the occasion, the President said that Allahabad High Court will complete 150 years of its existence on 17, March 2016. The High Court building will also complete 100 years of its existence in November 2016. There is thus a dual purpose to these celebrations in what is one of the largest temples of justice not just in India but the entire world. Today, the Allahabad High Court has jurisdiction over the largest state in India, covering nearly one-sixth of our total population. The rich jurisprudence emerging from this Court has benefited not just the people of Uttar Pradesh but the country at large. He congratulated the Allahabad High Court for its glorious contributions over one and a half century. He expressed confidence that the High Court will continue to uphold the basic values of equality, liberty and justice enshrined in our Constitution and safeguard the freedom and fundamental rights of our people so that they realize their full potential as worthy citizens of this great nation. 5. Members of its Bar played an important role in the freedom struggle and include illustrious personalities such as Pandit Madan Mohan Malviya, Pandit Motilal Nehru, Sir Tej Bahadur Sapru, Purushottam Das Tandon and Pandit Jawaharlal Nehru. The famous 'Chauri Chaura' and 'Meerut conspiracy' case are few cases wherein this Court delivered memorable judgments upholding the concept of liberty. 10. Our Courts are today overburdened on account of the large number of cases pending before them. There are over three crore cases pending in various courts throughout the country. Out of these about 38.5 lakh cases are pending in 24 High Courts. The pendency of cases in the High Courts has slightly declined from 41.5 lakh in 2014 to 38.5 lakh in 2015, but we still have a long way to go. Overall, out of a sanctioned strength of 1056 judges in all the High Courts, the working strength of High Court judges throughout the country as on 1st March, 2016 was only 591. Similarly, the sanctioned strength of judicial officers in district and subordinate courts in the country is about 20,500 out of which the working strength is only about 16,000 at present. 11. The High Court at Allahabad today has only 71 Judges including the Chief Justice, against the sanctioned strength of 160 Judges. Approximately, 9,11,908 cases are pending in this Court as of February 2016, a decline from 10.1 lakh cases in 2014. The pendency in subordinate courts of Uttar Pradesh is approximately 57,06,103 as on 29.02.2016. More than 42,17,089 (as on 29.02.2016) of them are criminal cases. 12. Justice delayed is justice denied. I am sure that the Central Government and the State Government will extend all support to the Allahabad High Court in its endeavour to reduce pendencies. The Governments, Judges and lawyers must work hand in hand to make justice a living reality. 19. As you are aware, the Government has launched the ‘Make in India’ campaign to turn our country into a manufacturing hub. To make this programme a success, we need to improve the ease of doing business in our country. Enforcement of contracts is a key yardstick in measuring the ease of doing business. The Government and judiciary must work in tandem to reduce costs and time taken for dispute resolution.